Tyrees Moulton led the North Canyon boys to a State Championship this spring for Division 2 by placing first in the 200m (21.41) and the 400m (47.49). Moulton also anchored the 4x400m to an impressive first place finish after receiving the baton in 4th place. What make Tyrees even more impressive is that he does not hesitate to try other events such as the 800 meters. At the Aztec Invitational Moulton mentioned in his interview he would be racing the 800m later that day and was excited to try the event. He ran an impressive 1:57.30 in his first attempt and placed second next to the two time state champ Daniel Lozano from Boulder Creek. On the national scale, Tyrees placed second in the 400m (46.62) at the prestigious Arcadia Invitational and is currently ranked the 3rd fastest junior in the country for the 400m (#2 AZ All Time List). All eyes will be on Tyrees Moulton next spring as his fans continue to follow his successful career in Arizona. Trey Johnson (Tolleson)- Johnson won the 100m (10.94) and was 2nd in the 110 hurdles for Div l.
Umajesty Williams (Chaparral)- Umajesty Williams placed 2nd at sun angel for the 200m and 2nd in state for the 200m (22.17) and 400m (47.91) behind Moulton for Div ll. 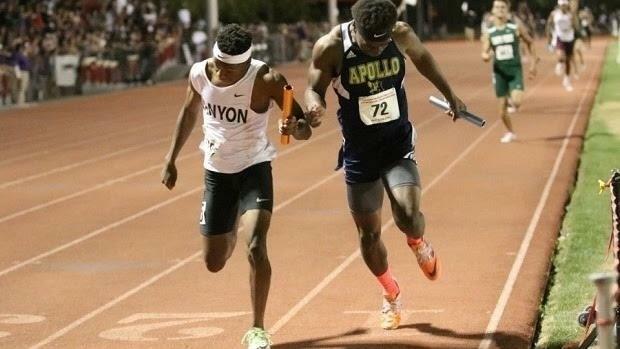 Darin Alderman (Mohave)- State Champ for the 100m and 200m and has the fastest time in AZ overall for the 200m (21.30).